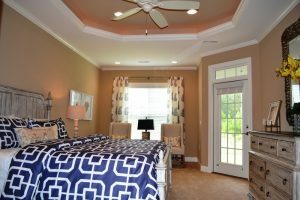 The master suite of the Plum Island at Brunswick Forest opens onto the screened porch. Tennyson Village at Brunswick Forest offers low-maintenance living at its finest, with brand new coastal town homes. The neighborhood is carefully nestled in a quiet section of this award-winning, master-planned community, and gives homeowners gorgeous homes with little exterior maintenance. Enjoy the region’s mild, coastal climate in your private walled courtyard. You can even add a gas fire pit for extra warmth or additional ambiance. Inside, the town homes offer modern, open floor plans and spacious first floor master suites. Outside, you can end the day on a relaxing note on these homes screened-in porches! For additional information on these coastal town homes, please call us at 888.371.2434.